When I played the game last year, what hit me almost instantly about The Banner Saga was the fact that, aside from being a smart turn-based strategy game, it was also one of the most beautiful video games I'd ever seen. So it's a real treat, in the same week the game's multiplayer component became available free to all, to get the chance to share artwork from the game's development. It's truly some of the most impressive stuff we've ever featured on Fine Art, and that's saying something. What makes it so special is that, in addition to being gorgeous in its own right, the art addresses a complaint I often see in the comment sections of this feature, where people lament the fact that finished video games rarely are able to preserve the spirit and colour of their concept art. 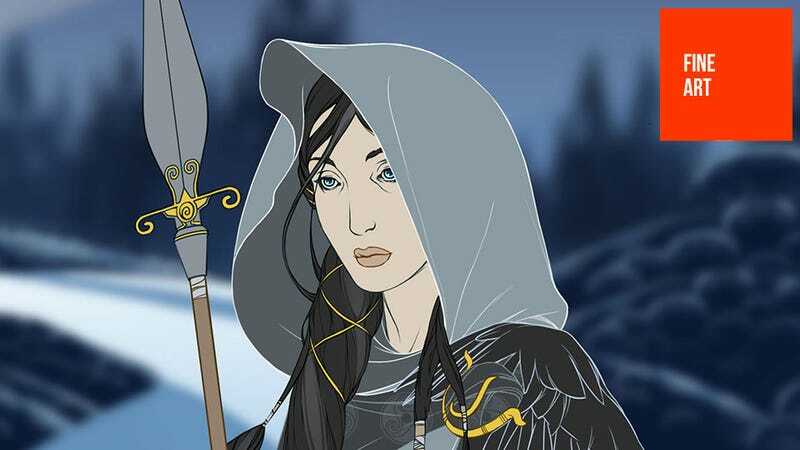 The Banner Saga can, because the game's concept work makes the jump to its 2D gameplay almost entirely intact, even down to the fact its animations are done by hand. A good example are the large, isometric pieces you'll see below; those are wonderful pieces of art, yeah, but they're also the actual maps you play the game on. The pieces you're seeing here were done by Arnie Jorgensen, who before he helped start Stoic Studio worked at places like Sony and BioWare, where he was a lead concept artist. As a special treat, every image below is at a fairly massive resolution, so your wallpaper needs for the next few weeks are well and truly taken care of.